So easy to make, this Vanilla Rhubarb Syrup is great added to ice cream floats, drizzled over ice cream, or used as a flavouring in your adult beverages. A few weeks ago we had a really bad hail storm in south-east Manitoba. We got hit with golf ball sized hail. If you follow me on Instagram or Facebook, you’ve seen the pics. Until then, I was so pleased with how well my new raised garden beds were growing. After we got with that kind of storm, I wasn’t sure what to expect. Would anything survive? Everything was shredded. The tomatoes had a lot of broken branches, the lettuce was mush, and the rhubarb leaves were completely torn apart. Thankfully, most of the garden is looking really good now. The lettuce is thriving, the beans and peas are setting on, and the cucumbers are beginning to climb up their cages. The only thing that isn’t looking great is the tomatoes, since some of the plants now have blight. Time will tell how much they produce before they dry off completely. After the hail storm, I harvested a bunch of the banged up rhubarb. Although I was tempted to make another pan of the Strawberry Rhubarb Bars, I decided to try something new instead. I made a simple Vanilla Rhubarb Syrup. A simple syrup is just that – simple. It is basically taking equal amounts of water and sugar, and cooking them until the sugar is completely dissolved. 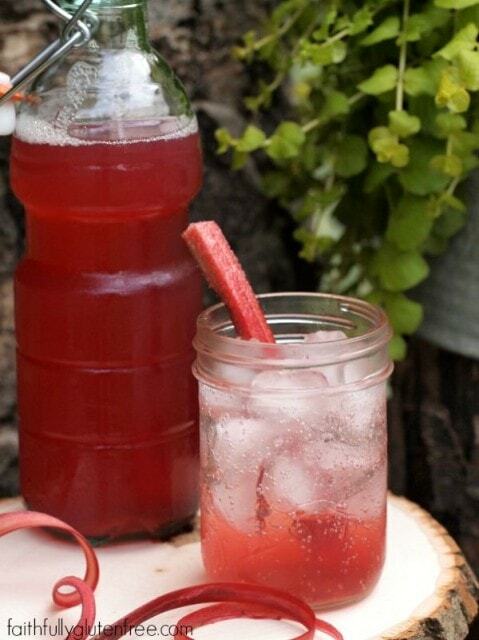 With this Vanilla Rhubarb Syrup, you cook the sugar and water with some chopped rhubarb and a split vanilla bean. If you don’t have the vanilla bean, don’t fret – it still tastes great without it, but then it would just be Rhubarb Syrup. In this case, I decided to decrease the amount of sugar slightly. Is it still a lot of sugar? Of course! But you won’t be drinking it straight up, you will be adding it to other things, so it gets diluted quite a bit. This syrup can be used any way you wish. Vanilla Rhubarb Syrup added some great flavour to Sprite and rum, and was also great in an ice cream float made with vanilla ice cream and Sprite. It is also refreshing added to pitcher of lemonade, or drizzled over a bowl of ice cream or vanilla yogurt. It would also be delicious brushed over a gluten free vanilla cake, helping to preserve moisture, and tasting great at the same time. This syrup can be used any way you wish. 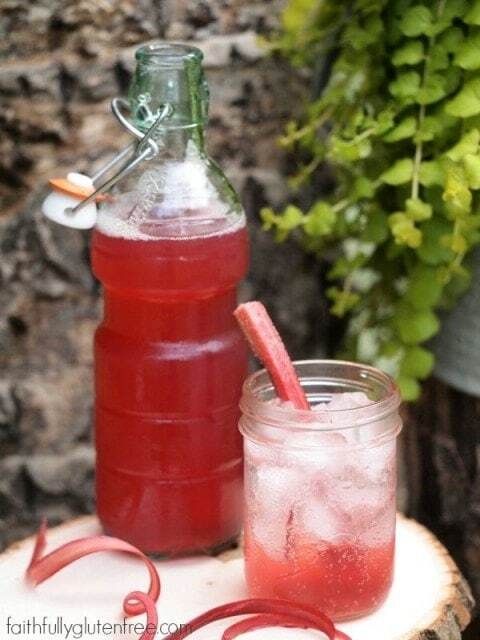 Vanilla Rhubarb Syrup adds great flavour to Sprite and rum, and was also delicious in an ice cream float made with vanilla ice cream and Sprite. A welcomed addition to a pitcher of lemonade, or drizzled over a bowl of ice cream or vanilla yogurt. It would also be delicious brushed over a gluten free vanilla cake - helping to preserve moisture, and tasting great at the same time. Place all the ingredients into a medium sauce pan. Stir to combine. Over medium-high heat, bring the mixture to a boil. Reduce the heat, and continue simmering until the rhubarb is cooked and tender, about 15-20 minutes. Place a wire mesh strainer over a bowl, and line with a double layer of cheese cloth. Pour the mixture into the strainer, and let the syrup drip through. You can squeeze out a little more using the back of a spoon. Place the syrup in a glass container with a lid, and refrigerate for up to 3 weeks. Don't discard the cooked rhubarb! Discard the vanilla bean, and use the cooked rhubarb like jam. It would be great on biscuits or pancakes. Your recipe for Rhubarb Syrup came just in time as our garden got hit last night with .25 and .50 cent size hail. Now my Rhubarb looks like yours did. Pretty well shredded everything and my lettuce looks like mush also. I will make the syrup out of the broken stalks of rhubarb. Thanks for coming to my rescue. Your Iowa friend. Barb B.
Oh what a great idea… I have some small sour cherries from my cherry bushes that I don’t feel like pitting. I have lots of cherry jelly from last year and I have been thinking of just cooking them and making a juice, so I think I’m going to give this a try with them.